It is well known that the US was the last of the great Western powers to establish diplomatic relations with Mongolia, it happened only in 1987. However, already in the early 1990s, the US became one of the main sources of inspiration and support for the democratic reforms in Mongolia and the country’s transition to democracy and market economy. Since then, the US – Mongolian relations developed steadily and in 2018 reached the comprehensive and expanded partnership stage with prospects of establishing a strategic partnership. These prospects were mentioned during the official visit of the Mongolian Prime Minister Ukhnaagiin Khürelsükh to Washington DC on September 19-21, 2018 following the invitation of the White House, and his negotiations with the US Vice President Mike Pence and the US Secretary of State Mike Pompeo. The meeting with Mike Pence took place in the White House on September 19. The parties exchanged opinions on a wide range of topics concerning the bilateral relations, as well as the key regional and international issues of mutual interest. Ukhnaagiin Khürelsükh expressed his deepest condolences to the families of the people who died because of Hurricane Florence and said that the Mongolian Government would provide the victims with camel wool blankets with the total cost of $100,000. He expressed his satisfaction with the successful development of the bilateral relations in the political sphere, defense, economy, culture, humanitarian sphere and other areas. The parties reiterated their mutual aspiration to improving their bilateral relations and cooperating in the framework of a ‘comprehensive and expanded partnership’ and agreed on the route map for developing and extending their economic partnership. Implementing the Route Map is called to expedite diversifying the Mongolian economy and enhancing its opportunities for cooperating with the US in agriculture and renewable energy sources. Furthermore, the US Congress is considering a bill on lifting the duties on the Mongolian cashmere and textile products imported to the US. In his turn, Mike Pence thanked the Mongolian Government and the whole Mongolian people for providing assistance for the victims of the natural disaster and congratulated the Mongolian Armed Forces personnel that are currently performing their peacekeeping mission in Afghanistan with honor. “The US considers its relations with Mongolia very important,” said the US Vice President. 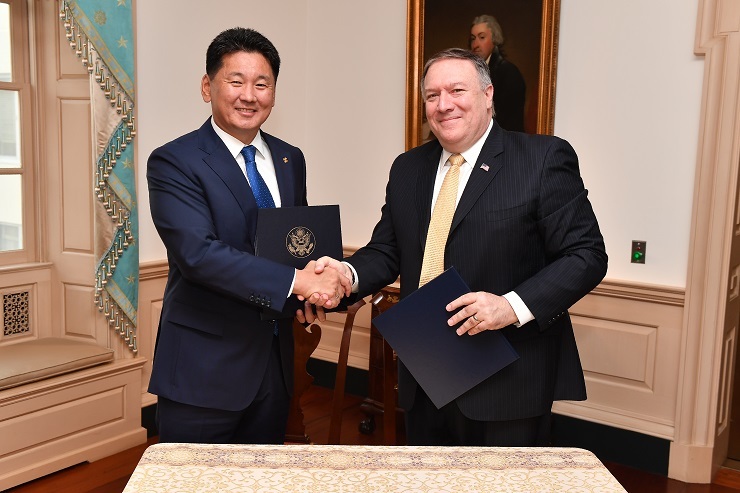 On September 20, the US Secretary of State Mike Pompeo held a meeting with the Mongolian Prime Minister Ukhnaagiin Khürelsükh where they discussed the issues of the 2 countries’ bilateral relations and regional and international partnership. The parties reiterated with satisfaction that, as a result of this visit of the Mongolian Government Head to the US, the bilateral US – Mongolian relations reached the level of ‘comprehensive and expanded partnership’ and expressed their willingness to complement it with enhanced economic cooperation. The Mongolian Prime Minister Ukhnaagiin Khürelsükh called on the US to become a large investor and a trade partner for Mongolia. Speaking of the US – Mongolian diplomatic relations, the Mongolian Premier noted the expansion of the cooperation both on the regional and the international level which is proven, in particular, by Mongolia’s active participation in peacekeeping operations. He congratulated the US President Donald Trump and the US Secretary of State Mike Pompeo on resolving the Korean peninsula nuclear issue in a peaceful way. Ukhnaagiin Khürelsükh and Mike Pompeo discussed a number of other specific issues and expressed their great satisfaction with their meeting on the whole. After the official visit, a Joint Policy Statement consisting of several sections was published. The US reiterated the great significance of Mongolia’s own contribution to its transition to a free democratic society and noted that Mongolia is, among other things, its key ally in the Indo-Pacific region. The Mongolian party expressed its gratitude to the US for its consistent support of the Mongolian transition to democracy, as well as for its cooperation and partnership in strengthening the market economy, creating sound management institutions and expediting sustainable economic development. Mongolia reiterated that the US is its important third neighboring state, close friend and partner. In the section titled Regional and International Security, the US first of all congratulated the Mongolian Armed Forces personnel on their meritorious service in Afghanistan of many years and expressed its hope that the Mongolian Armed Forces would continue their participation in the Resolute Support Mission after 2018. The US expressed its gratitude to Mongolia for its contribution to international peacekeeping: holding the annual international maneuvers Khaan Quest in its territory. The 2 parties also reiterated the significance of the full denuclearization of North Korea and implementing all the UN Security Council resolutions regarding this issue. The US thanked Mongolia for its assistance in this respect and insisted that it continue to support the efforts made by the international communities. In the section of the Joint Statement covering economic cooperation, the 2 parties advocated further strengthening of their economic, trade and investment relations in the framework of the new partnership for the benefit of both countries and the full implementation of the route map for extending their economic cooperation. The parties especially welcomed the signing of the Second Compact Agreement with the Millennium Challenge Corporation under the auspices of which the US will provide Mongolia with a tranche to the tune of $350 m for improving the Ulaanbaatar water supply infrastructure. In the conclusion of the Joint Statement titled Shared Values and People-to-People Exchange, the 2 parties reaffirmed that their shared commitment to freedom, democracy, and human rights represented a cornerstone of their bilateral relationship. The parties also noted the importance of maintaining the frequency of high-level dialogues and bilateral mechanisms, including the Annual Bilateral Consultations, defense talks, the Economic Policy Dialogue, Trade and Investment Framework Agreement (TIFA) talks, and the Energy Cooperation Dialogue to discuss and collaborate on efforts to advance the bilateral priorities of the intergovernmental sector and the governments, as well as international peace and prosperity. Thus, Ukhnaagiin Khürelsükh’s visit marked the beginning of a new phase of close rapprochement between Mongolia and the US. And the assistance provided for resolving the Ulaanbaatar water supply infrastructure issue is a considerable contribution to the country’s economic development. Let us note that the program of his visit to the US included, apart from the bilateral negotiations, a meeting with the Mongols living in the US, participating in the 73rd session of the UN General Assembly, visiting the United Nations Development Programme (UNDP) Administration and participating in the congress of the Socialist International (SI) nongovernmental organization, etc.